Michael (who was wearing a moustache long before hipsters made it cool) is getting older. Its hard to believe, but my beautiful cat Michael turns 14 this year. She's well any truly a senior though the way she jumps around at times you would hardly believe it. Michael has been with me since a good samaritan found her attempting to cross Parramatta Road as a kitten. She was around when I qualified as a vet, sat on my keyboard for pretty much my entire masters degree, and even thwarted a burglary by alerting me to the presence of an intruder. If I sleep in she gently pokes me in the eye until I wake up. But lately she seems a bit stiffer and tentative at times, most likely due to oesteoarthritis. I want her to be as comfortable as possible so wanted to commence treatment with some non-steroidal anti-inflammatory drugs. Ideally, one runs a complete blood count, biochemistry panel and urinalysis to detect any underlying disease before commencing treatment. She let me take a blood sample and the results returned pretty normal, much to my relief. There are two good ways to collect a urine sample in cats. Neither of them involves asking your cat to urinate in a specimen jar, although I have known a few clients over the years who have hidden beside the litter tray, waited til the cat was mid-stream through a morning pee and dived underneath them with a jar. This doesn't always do great things for human-cat relations and may end in the cat bolting, mid-stream, through the house. A much more reliable method of urine collection is known as cystocentesis. 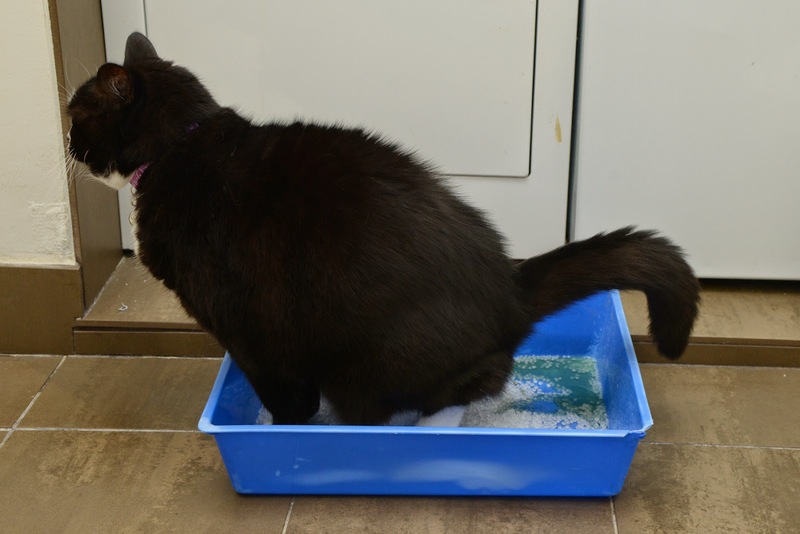 This is not one to try at home, but if your cat presents to the vet clinic with a reasonably full bladder the easiest way to obtain a nice sample is to pass a needle through the abdominal wall and into the bladder. This technique IS also used in people though less commonly. Its the best way to obtain a sterile sample as you bypass all of the colourful flora dwelling in the distal urethra. And most cats don't get too worked up about this - they don't have the psychological fear of needles that is so prevalent among humans. 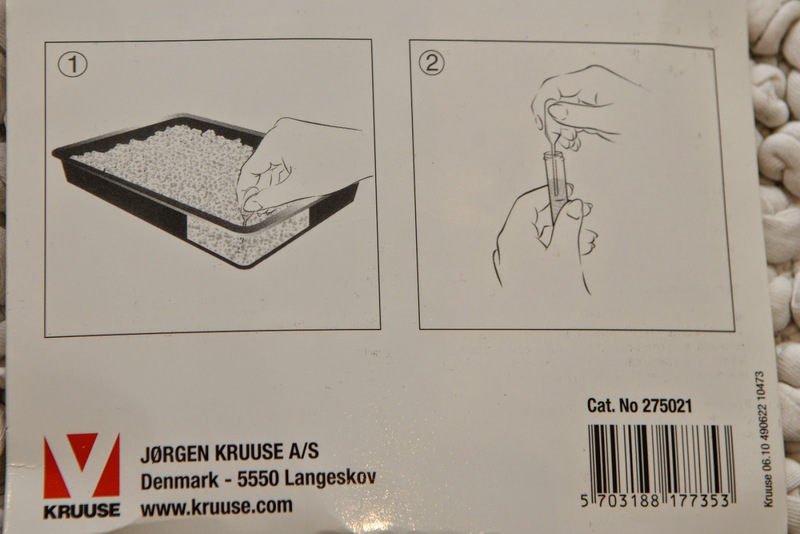 Litter beads for urine collection. 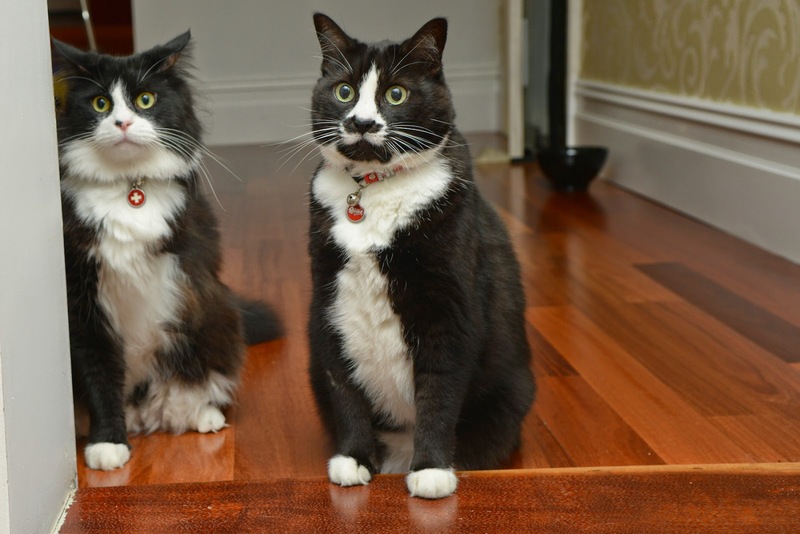 Knowing your cat's routine helps. For example, I know the order in which Michael performs her morning ablutions. Thus I only make the beads available when I know she is going to urinate, as opposed to doing something else. I also know how to distract the other cat in the house, so that Michael has the bathroom to herself and I know the sample is from her (collecting a urine sample from Hero, much as he is willing to oblige, isn't going to tell me much about Mike's renal function). 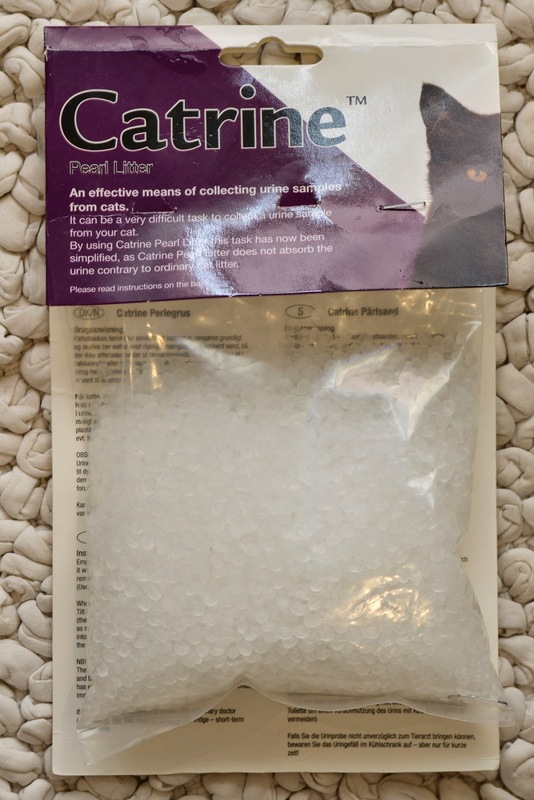 [If you have a multi-cat household or know you won't be home when the magic happens, or you just really don't want to touch cat urine, an alternative is to board your cat at a vet clinic and get them to collect the sample when it appears]. The process was easy. I waited for the right time, filled the tray with the beads and showed Michael. She was so excited about the sound they made as she stood on them that she provided a sample immediately. Sorry Mike, but for the benefit of readers this is how it went down. Michael provides a urine sample. You can see that unlike normal litter, these beads don't soak up the urine. The sample. 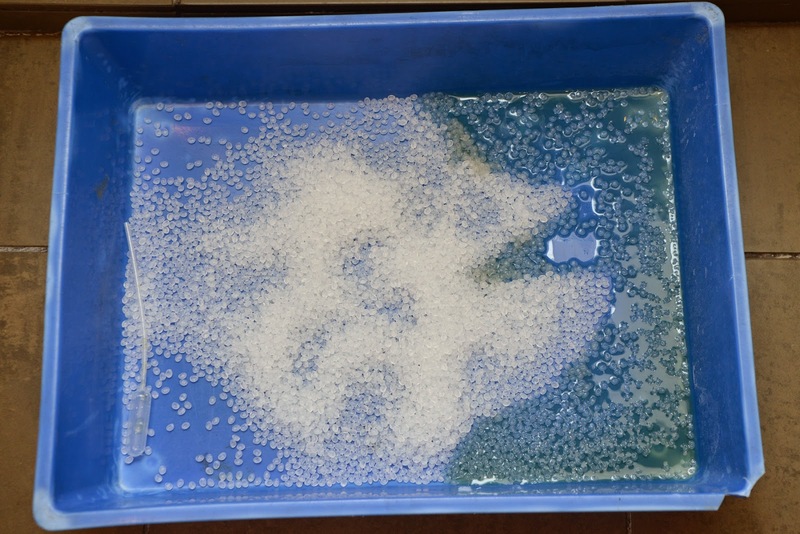 On the left of the tray is a pipette provided in the pack to collect the sample after, and on the right is the sample. If you look at this side on, or flip it anti-clockwise, you can see that Michael's sample has created an "M" pattern in the litter. She IS a very talented cat, but peeing your initials Michael? Well, that's just being an overachiever. Really. Using the pipette one collects the sample into a test tube. The instrctions on the label say it all really. Liquid gold. 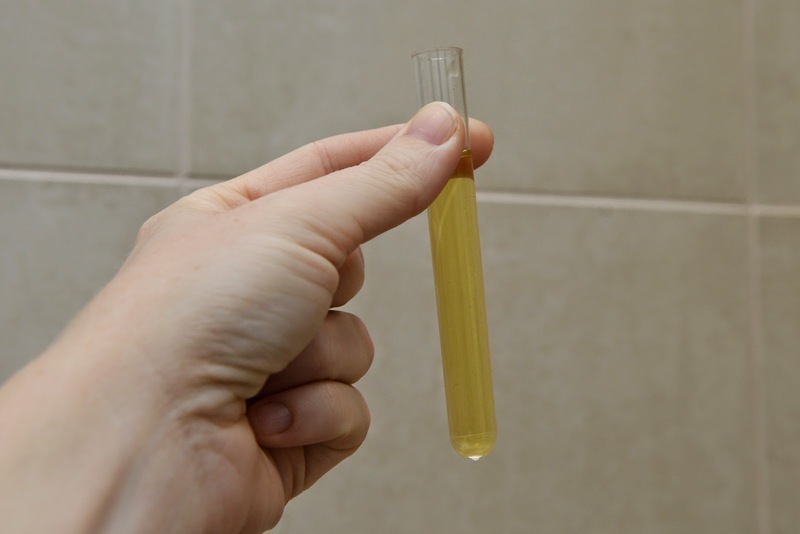 A generous urine sample from a cat, collected painlessly and rapidly. The whole process took around five minutes. The good news is that her urine looks great - concentrating off the scale, and no sign of glucose, ketones, blood and so on. We've started a course of non-steroidals (Meloxicam for cats) and will report back on her mobility and comfort. Meanwhile please give Michael a round of appaws for sharing her tips. 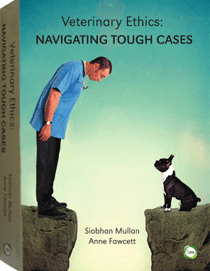 Hopefully this will help others collect a urine sample from their cat when the need arises. 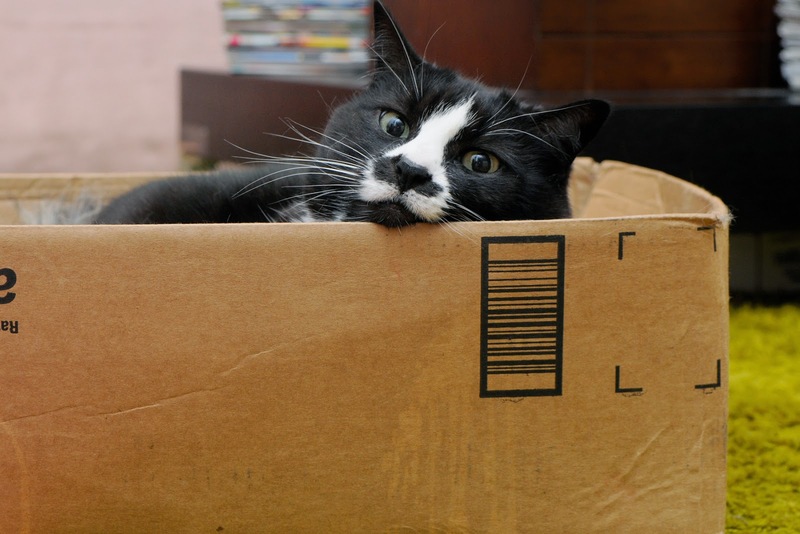 Michael demonstates that you're never too old to appreciate a good cardboard box.